Make the most of Apple season! 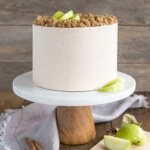 This Apple Crisp Cake pairs spice cake layers with a delicious homemade apple pie filling and apple crisp crumble. In a medium bowl, whisk flour, spices, baking powder, and salt until well combined. Set aside. Using a stand mixer fitted with a paddle attachment, cream butter and until smooth. Add sugars and beat on med-high until pale and fluffy (approx 3mins). Alternate adding flour mixture with milk, beginning and ending with flour (3 additions of flour and 2 of milk). Fully incorporating after each addition. Bake for approx. 40 mins or until a toothpick inserted into the center comes out mostly clean. Toss chopped apples and lemon juice in a large bowl, set aside. In a large saucepan, combine sugars, cornstarch, and spices. Pour in water and whisk. Cook over medium heat until boiling. Cook for 2 minutes, stirring occasionally. Add apples, bring back to a boil. Simmer, stirring occasionally, until tender (10-15mins). Cool completely. Preheat oven to 350F. Whisk flour, oats, cinnamon, and brown sugar in a medium bowl. Add enough melted butter so that the mixture starts to clump. Spread on a parchment lined baking sheet and bake for approx. 10 mins. Cool completely. Break crumble apart if needed. Add vanilla and cinnamon and whip until smooth and fluffy. Place one layer of cake on a cake stand or serving plate. Top with approx. 1 cup of buttercream and spread evenly. Pipe a border of buttercream around the outside to hold in the apple pie filling. Fill with approx. 2/3 cup apple pie filling, spread evenly. Sprinkle with approx. 1/2 cup crumble (smaller pieces). Press gently into apple pie filling. Repeat with next layer. Frost and smooth the top and sides of the cake with remaining frosting. Place larger chunks of the crumble around the top of the cake.